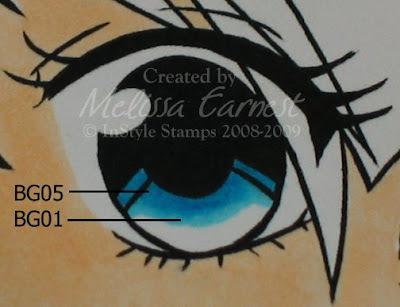 One of the things that make anime stamps so appealing is their large, soulful eyes. 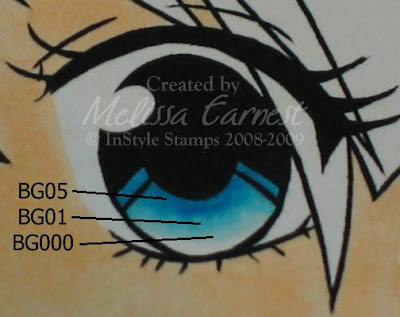 When InStyle Stamps was preparing to release our line of Anime stamps back in January, I browsed the web and looked at tons of anime images to determine just the right way to color the eyes to show them to their best advantage. I made a little tutorial for our design team, which I am now going to share with you. 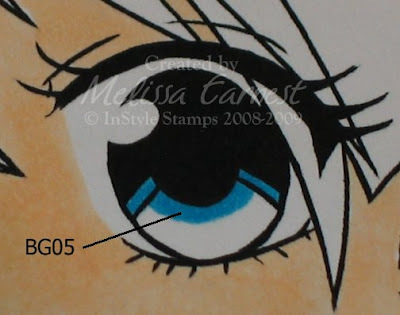 When coloring in the face, leave a white area around the eye going from the tip of the eyelash to the line under the eye as shown. 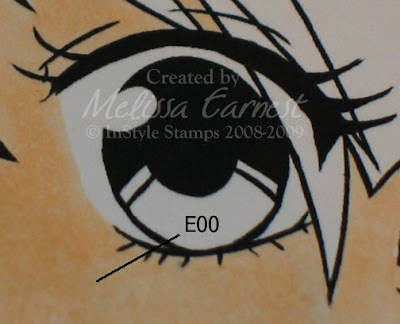 In my sample, E00 is used to color in the face. The eyes are going to be colored in layers. Pick 3 shades of marker, a dark, a medium, and a light. I used my darkest blue, BG05 to lay down my first ring of color. Now add in a second layer of color in a lighter shade than the first, in this case BG01. Go over the BG05 color layer with the BG01 marker to start blending the two colors together. Notice that while there is some definite blending where they overlap, each color is still distinct. Add in your lightest color, BG000 in the sample, for your third layer of color. You will again go over the previous layers of color to blend. 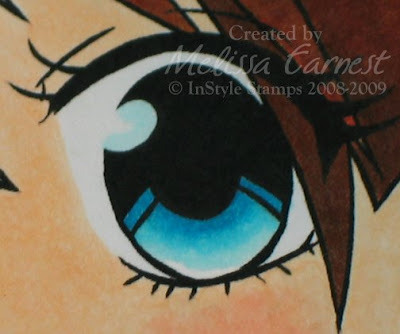 Leave a small area at the bottom of the eye uncolored. This adds depth by showing where the light is hitting the eye. 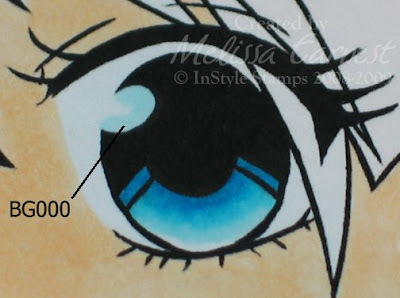 Add a layer of the lightest color, in this case BG000, to the ring at the top of the eye where light is being reflected. 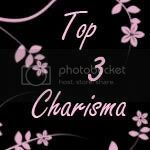 See how easy it is to get a fabulous looking eye? Now what are you waiting for, whip out those Copics, and get coloring! It's the last Friday of the month, and you know what that means - it's time to go blog hopping with InStyle Stamps! This month, the design team was given an image from our new fantasy line, debuting today! As usual, we will have some great prizes to give away, so make sure to read all the way down to the bottom of the post to see how you can get entered into a drawing for some great goodies! 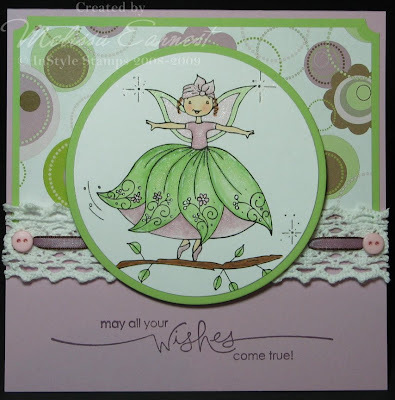 When Virginia showed me the new images, I knew I had to work with the adorable new Twirling Fairy image. She is just so cute! For my blog hop project, I decided to make a birthday card with matching wrapped gift for a friend who's is celebrating the big 40 next week. Think she'll like it? Matching wrapped gift, you say? How did you do that, you say? Well let me let you in on a little secret... not only is digital paper great for cards and scrapbooks, but it makes great custom gift wrap! 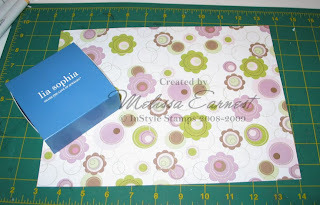 For my gift wrap, I printed the White Circles and Posies digi paper onto copy paper. Yup, you read that correctly, plain old copy paper. 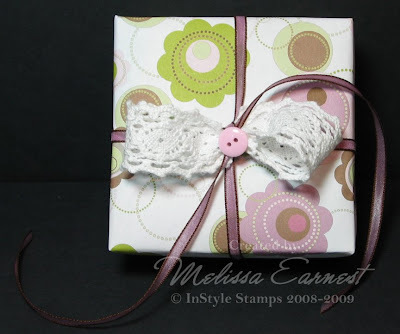 I then added on ribbon, lace, and a pink button to match my card. See how quick and easy it is to add a personal touch to your wrappings? 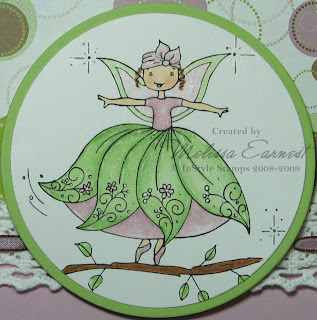 For the card, I colored in Twirling Fairy with copic markers and added some highlights with my trusty white gel pen. I don't know about you, but when I think of fairies, I picture gauzy dresses made out of some gorgeous shimmering fabric, so I went over the image with Angel Wings Shimmerz to try to recreate that effect. As you can see, the designer paper is more of the White Circles and Posies digi paper, this time printed onto cardstock. I used the ribbon and lace from the gift wrap, and added in two pink buttons in a smaller size so everything coordinates. My favorite fairytale has always been Sleeping Beauty. I saw the Disney movie as a child and was enchanted. The amazing music and the funny antics of the 3 Fairy Godmothers sucked me right in. "Make it Blue." "I said Pink!" LOL. I've read many other versions of the tale (Robin McKinley's "Spindle's End" is an entertaining romp with a less helpless heroine.) 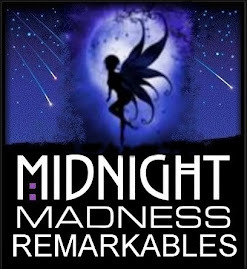 over the years, but the Disney movie version remains a favorite. 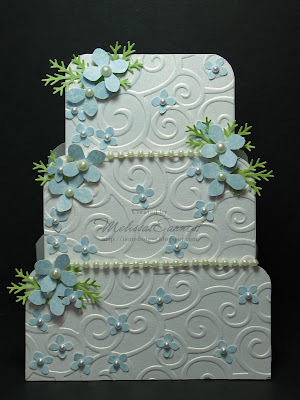 While blog hopping last week, I came across this adorable wedding cake card by Melissa Rove. It is so sweet, it instantly went into my "must case" file. LOL. My co-worker got married last weekend, so that gave me the perfect excuse to make a wedding cake card of my own. Cut a piece of card stock to 4.25 x 5.5 inches. 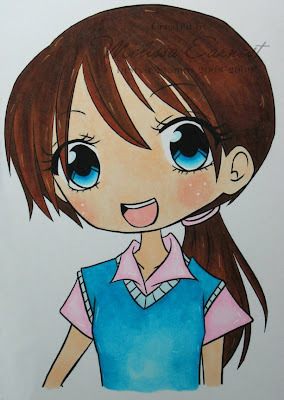 (I used a piece of shimmery white card stock for my card.) 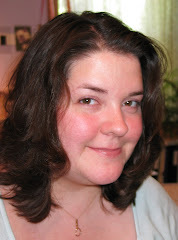 Cut 2 inches off of this for your bottom layer (you will have a 2 x 4.25 inch piece). Now cut the remaining piece in half so you have two 1.75 x 4.25 inch pieces. Trim one of your 1.75 pieces to 1 3/4 x 3 5/8 inches, and the other piece to 1 3/4 x 2 7/8 inches. 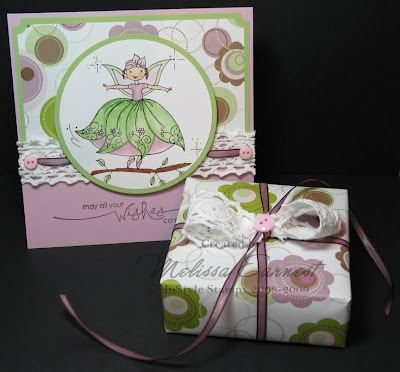 Use your corner rounder to round 2 edges of each piece as shown on the card. Now that you have your layers made, emboss each layer with the Cuttlebug folder of your choice (I used D'vine Swirl on mine.) before gluing them in place on a 4.25 x 5.5 card base. Carefully cut the card base to the shape of the cake, and you are ready to decorate. I used the Martha Stewart small hydrangea and branch punches as well as some pearls that were leftover from my wedding decorations. 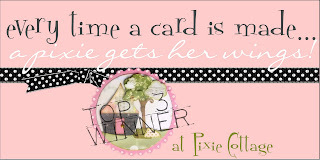 I know it sounds complicated, but trust me, this card whips up in no time flat.